I couldn't possibly improve on the description of Gloom provided by it's makers. Enjoy . . .
"The world of Gloom is a sad and benighted place. The sky is gray, the tea is cold, and a new tragedy lies around every corner. Debt, disease, heartache, and packs of rabid flesh-eating mice -- just when it seems like things can't get any worse, they do. In the Gloom card game, you assume control of the fate of an eccentric family of misfits and misanthropes. The goal of the game is sad, but simple: you want your characters to suffer the greatest tragedies possible before passing on to the well-deserved respite of death. You'll play horrible mishaps like Pursued by Poodles or Mocked by Midgets on your own characters to lower their Self-Worth scores, while trying to cheer your opponents' characters with marriages and other happy occasions that pile on positive points. The player with the lowest total Family Value wins. " cool by the way, have many o you read the hichhikers guid to the galixy!! its the only one that can compare with yours!!! hey, my friends already think I have suicide issues. (I DO NOT, sffh!) yet i still type here today.. interesting. Wahoo! that board game sounds WICKED AWESOME! Man, idk if I would want that. It seems a little dark. But kinda interesting all at the same time. on a completely unrelated note, check out the devil frog! Its name, Beelzebufo ampinga, came from Beelzebub, the Greek for devil, and bufo -- Latin for toad. Ampinga means "shield," named for an armor-like part of its anatomy. i saw an article on the devil frog in the papers. 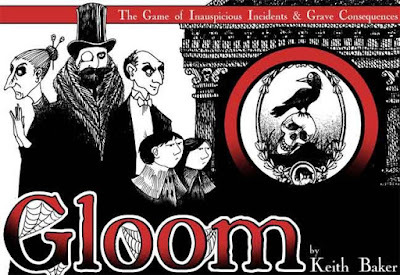 i i told my friends about a game like this they'll all be like "You need help..." But at least it makes us feel grateful for what we have, compared to the characters of Gloom. Wings of Steel- If I'm not mistaken, "Beelzebub" technically means "Lord of the Flies." I saw it on Jeopardy one time. coolyo! that is...depressing. in a goog way. kinda. i might like that game, considering i like cloudy days rather than sunny ones. i LOVE the picture, too. I want that soooooooooooooooooooooo bad! I bet it's awesome. I think my goth friend has it. my friends already think im crazy sooo what does it matter? WHERE CAN I GET ONE??? Dine . . . and Die!